Soil pH -What is It and Why Should I Care? Soil pH is a measure of the amount of acid or base in the soil. pH values range from 1, which is extremely acid (think battery acid) to 14, which is extremely basic (think lye). 7.0 is neutral, being neither acid nor basic. 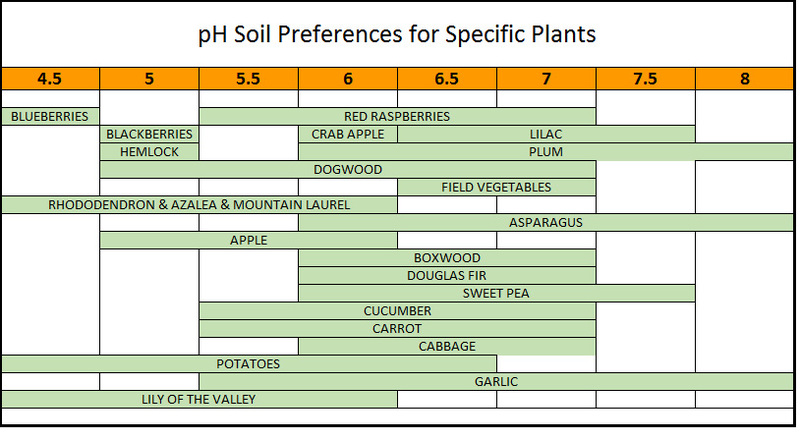 Most soils have pH values between 4.5 and 8.0. Soil pH is important, because each type of plant has on optimal range in which it can most easily extract nutrients from the soil. Outside of that range, a plant will struggle to get the nutrients it needs, and will not thrive. For most plants, the ideal range of pH is between 6.5 and 7.0. This group of plants includes lawns as well as most vegetables, flowers, shrubs and trees. Some plants may require a higher or lower range. For instance, blueberries, hollies, azaleas, and rhododendrons prefer a pH between 4.5 and 5.5. Potatoes avoid developing scab best when the pH is between 5.2 and 5.4. Lavender, on the other hand, prefers a higher pH of 65. – 7.5. It is best not to put plants with widely different pH needs close to each other, as it will be difficult to maintain different values in a small area. If your soil pH is too low, you can adjust it by adding lime. This is generally available as either ground limestone or pelletized lime. Both work the same way, but ground limestone is slower acting and the effects of an application will last longer. Pelletized lime is actually an extremely fine powder that is bound together with a water soluble polymer, it acts more quickly, but washes out of the soil faster. If your soil pH is too high, you can adjust it by adding agricultural sulfur. Whatever you choose to amend your soil with, it is important to have the pH measured first, and then to add only the recommended amount of lime or sulfur. Adding too much will drive the pH through the neutral point and out the other side. pH adjustments do not last forever, because rain can leach minerals from the soil and the underlying subsoil and bedrock will tend to bring the soil back to its native state. Therefore, it is important to test your soil every year. If your pH is lower than 5.5 or higher than 7.5, you should add some adjustment in the spring, then test it again in the fall and add more amendments if necessary. The amount of lime or sulfur that you need to add is also affected by the texture of your soil. Sandy soils require less lime than normal soils and clay soils require more. This is why it is important to have you soil tested by someone who is trained and to follow the recommendations of that person. Keep you pH in the proper range, and you will have gone a long way towards helping your plants to thrive.